Todd Wenzel is president, TCR, Inc., Wisconsin Rapids, WI: 800/676-2240; www.stampingsystems.com. While E.J. Ajax, a contract stamper and fabricator in Fridley, MN, has a rich, 70-yr. history, the eyes of its management team are fixed on the future, not on their successes in the past. A tool in this new 200-ton servo press undergoes tryout (note the electrical connections and air-operated devices). Using the servo press’ abilities allowed the E.J. Ajax toolroom to design a die with multiple operations, automated and combined into one tool. The resulting savings achieved by eliminating secondary operations means less setups, less labor, less cost to produce the part, less lead time from order to ship and less inventory. E.J. Ajax co-owners Erick (vice president of sales) and Tom (vice president of manufacturing) Ajax believe in training and their investments prove that they mean it. In addition to the growth in numbers and skills of staff has been a focused strategy of investing in new technologies to optimize production. In the past two years, these investments have included a fiber-laser cutting machine, a new CNC turret press and stamping-press equipment with the latest direct-drive servo technology. Tom Ajax identified those applications. In the fall of 2014 Ajax took delivery of its first 200-ton servo press, an Aida gap-frame model, followed by a second Aida 200-ton gap-frame. This tool, outside of the press, shows a number of air cylinders and electronic components. The simple tool in use at E.J. 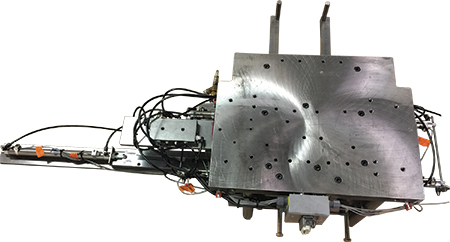 Ajax has been transformed into a machine with logic, all made possible due to a new servo press’ programmable motion and its controls-programmable outputs and inputs. Training started immediately, first with a nearly companywide meeting of operators, setup people, tool designers, and outside sales and sales management personnel. “Everyone needed to know what this new equipment could do in order for us to fully realize the benefits of the press’s abilities,” says Djubek. Multiple rounds of onsite training were provided by the local Aida dealer, TCR, Inc., Wisconsin Rapids, WI, and by Aida’s engineering staff. The training time was surprisingly short, according to the Ajax management team, as the already-skilled operators became quick learners. The most unusual discovery? The Ajax team found that it could take a tool from its hydraulic press, used for drawing, and run it on the new servo presses. 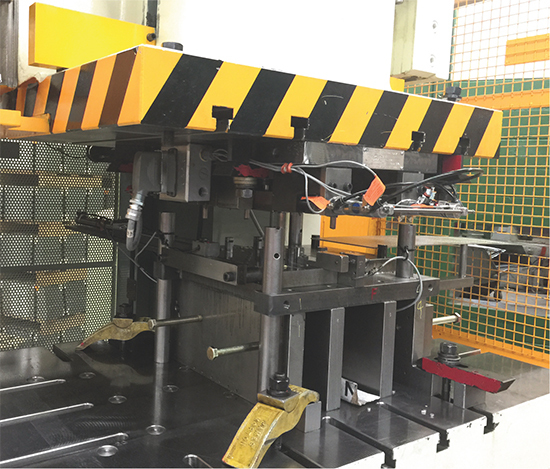 “That tool was actually too tall for the servo press’ standard shut height,” says Djubek. “But, we are actually able to run it in the servo press by programming its stroke so that it never reaches all the way to bottom dead center. 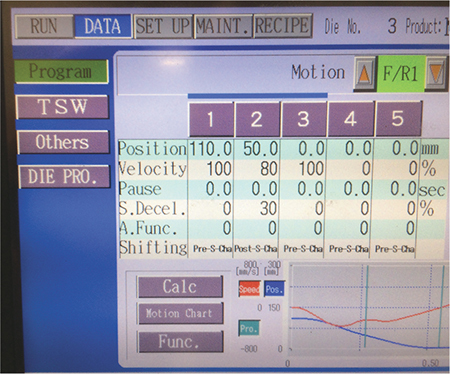 The slide’s motion profile is programmed in steps on the servo press’ control, with velocity set at various positions above bottom dead center (BDC). This particular program enables a rapid and brief deceleration at a position where blanking occurs, resulting in a significantly reduced reverse load. This allows materials such as stainless and HSLA steel to run at high parts/min. output while reducing damage to equipment and tooling caused by reverse load. Not long after the two new-press installations, the Ajax sales team approached the tool-design group with a new part to quote, from 10-gauge Type 316 stainless steel. Slightly more than 6 in. long, the part is very narrow, less than ½ in. in places. It also had holes and cutouts paired with a challenging flatness specification. Since Ajax had run similar parts in the past, the team knew where the challenges would lay. This time, the team looked to the new servo capabilities to develop a more efficient forming process and reduce costs. It wasn’t disappointed. Immediately after forming but prior to lifting off the strip, the press’ programmable control switches on an air valve so that the die-mounted air cylinders actuate and allow grippers to grab the strip. As the ram lifts the strip the cushion also lifts the part. With the strip out of the way, the parts can be ejected—triggered by a programmable limit switch. The press only raises enough to allow the part to be ejected, then reverses direction and passes back through bottom dead center, releases the strip and lifts back up. The control sends a command to the feed on the way up and the press stops while awaiting a sensor input indicating that the strip has been fed forward. When the sensor indicates that the strip has fed into position, the press then reverses direction, thus restarting the entire sequence. The press never passes through the top of the stroke…something impossible to do without a servo press. Compared to the previous forming process, the part stays dead flat without a second tool and manual operation. “We reduced the cost to manufacture a quality part, reduced work in process and reduced tooling expense for our customer,” says Djubek.